This story was updated at 12:57 p.m. EST on March 9. So far, the effort has gained the support of more than 10,600 Pluto fans since the petition launched on Feb. 1. SPACE.com is tracking the new Pluto stamp effort through its March 13 deadline. The petition, hosted at Change.org, will be submitted to the Citizens' Stamp Advisory Committee of the U.S. Postal Service. 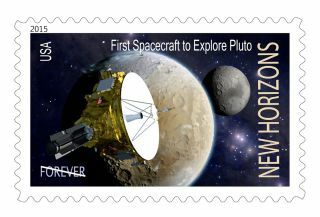 Click here to read or sign the Pluto stamp petition "Honor New Horizons and the Exploration of Pluto with a USPS Stamp." "The Pluto postage stamp petition may mark a first," said Robert Pearlman, editor of SPACE.com partner site collectSPACE.com. "While NASA has collaborated with the U.S. Postal Service dating back to the 1962 'Project Mercury' secret stamp released to celebrate John Glenn's orbital spaceflight 50 years ago this week, the New Horizons campaign may be the first time that a NASA mission has taken an active role campaigning for a new stamp." "It is the first I can remember NASA soliciting the public's help in having a commemorative stamp issued," Pearlman said. The first Pluto stamp was issued in 1991. It consisted of an artist's depiction of Pluto emblazoned with the phrase: "Not Yet Explored." NASA's New Horizons mission aims to change that. The unmanned probe is flying NASA's first expedition to Pluto and is due to fly by the distant world and its four moons in July 2015. The $700 million spacecraft will take the first-ever close up photos of Pluto, its largest moon Charon and three other satellites when flies within 6,200 miles (10,000 kilometers) of the planet.